The city council holds an Ondernemersontbijt Den Haag (Entrepreneurs Breakfast) four times a year. 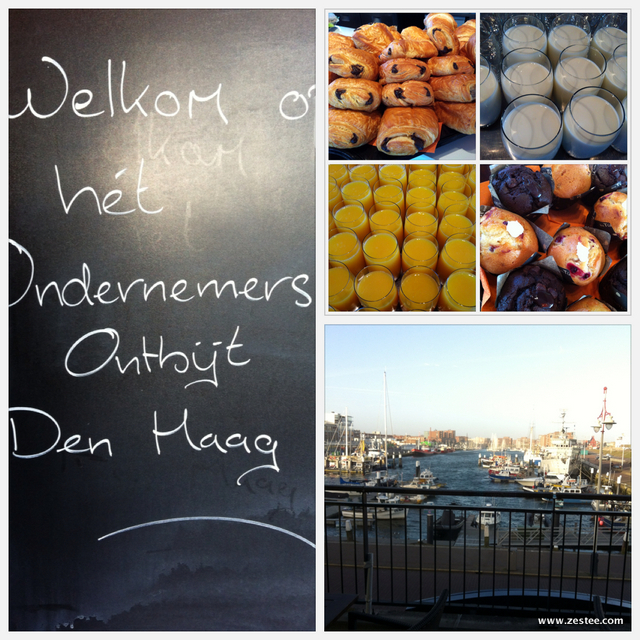 I attended for the first time this week, and it was held at Blu Events, Scheveningen. There was a lovely view over the harbour and it was a nice sunny day – but also happened to be the windiest day so far this year, so I’m glad it was all inside! Networking in Dutch is a bit of a challenge – I’m fairly fluent but as the room grew more and more crowded, it became difficult to hear very clearly! However most Dutch people are quite fluent in English though I’m determined to improve my Dutch so do try and communicate as often as I can in “Nederlands”. I really liked the atmosphere and the way that several people were purposefully making an effort to approach and talk with new people. Of course, this is the whole purpose of networking, but many events I’ve been to, people often form more closed small groups. You may notice several are in the same field as I am – social media and marketing – but I have always had the opinion that there are ways to work together and am glad most people I meet seem to feel the same. It’s certainly a growing field. We talked about a few opportunities we may be able to pursue. In particular, what emerged from conversations is that being a native English speaker who can understand Dutch fairly well could develop into services where I could assist native Dutch speakers aiming to impress an international market. Though most Dutch people speak and write English really well, native English speakers will usually notice “Dutch English” in marketing text, so I could perhaps give marketing content a more “native” spin. Also nice to run into Marie-Louise from MLB Foto who I met recently at a Delft INA event – lovely to be settling into The Netherlands and start to recognise people when I’m out and about! Each Ondernemersontbijt Den Haag has a theme and this one was about being inclusive as employers and appreciating diversity. The Den Haag Incl. campaign has a nicely designed website and booklet with the central message of not judging others too quickly, especially based on their cultural background and age. It uses a combination of facts, photos and ideas to encourage employers to think more broadly in terms of staffing for the future. “Don’t judge people on their external appearance or background, but on their passion, motivation and qualities. This will ensure your organisation will flourish and be prepared for the future”. With a population of more than 500,000, Den Haag has more than 150 nationalities! I am one of those, though I am dual national Dutch Australian, and am not one of the 34% “niet-westers” (non western) migrants. Though it is never really said outright, especially officially, from my (fairly limited) understanding I believe it’s mostly Turkish and Moroccan migrants that are in this group. On the way home from the breakfast, the Den Haag radio station announcers were talking with someone who attended and analysing the situation. Their perspective is that it’s all well and good to promote inclusiveness and try to tackle the high unemployment rates, particularly in the “non western youth” demographic, but that they needed to be fluent in Dutch and that many weren’t. Interestingly enough – I agree in part, employers do need staff to have these basic skills. However I can personally attest to the frustration of moving to another country and finding that your employment options are much more limited – despite the fact you are experienced and trying hard to learn to fit in with a new culture and master a new language. Some reactions to this seem to be – well go back “home”, but in most cases it’s a lot more complicated than that. Back to the event. The entire evite system, from that registration form right through to the event itself is worth a mention – also a Den Haag business, I liked the extra touches such as a welcome SMS when you checked into the event. The food was also delicious – the muffins which I think were raspberry with a surprise white chocolate cream inside were YUM! So overall, the Ondernemersontbijt Den Haag was an interesting and enjoyable morning and appreciated the chance to be part of it. If you run a business in Den Haag – large or small – you can register to be on the invite list for future events here. I’m off to try and connect with those I met on LinkedIn and send them a link to this blog post! Do you enjoy networking events? Do you usually follow up again with those you met later? Love your comments below.